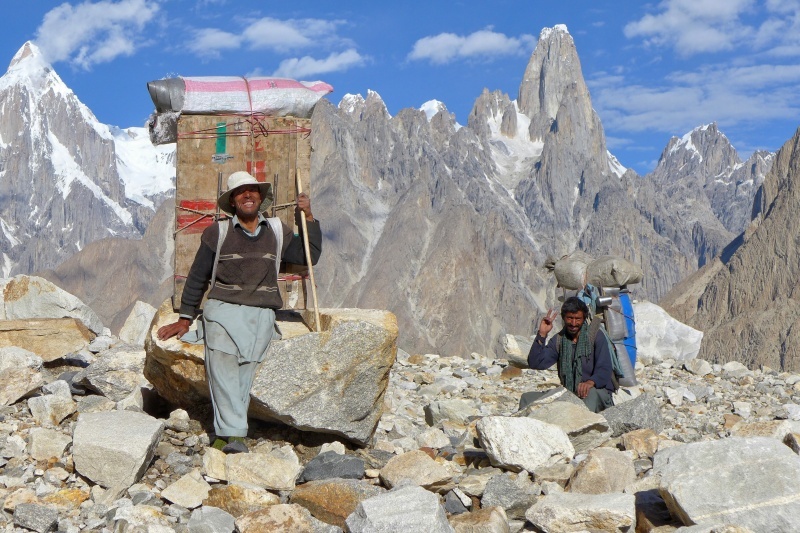 Before this expedition I was climbing in Karakoram already two times. On my first visit in 2006, I climbed several routes in Trango Towers together with my brother Nejc. 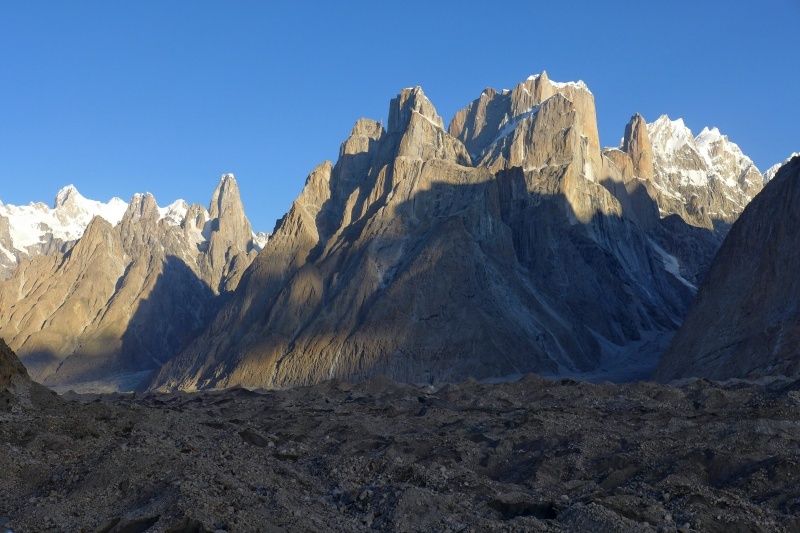 During few weeks period we summited Great Trango Tower, Trango Nameless Tower, Little Trango Tower and Trango Monk. It was extremely successful expedition with difficult rock climbing but not extreme height. 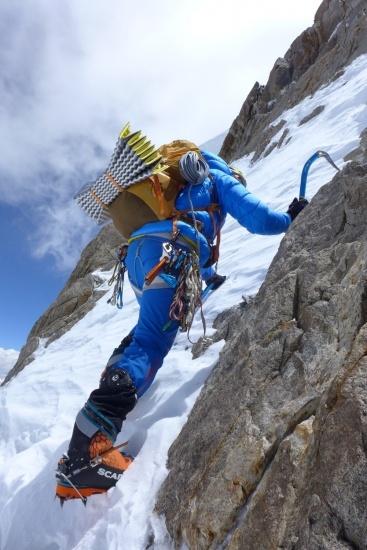 I was back two years after in 2008 when I was climbing with Rok Blagus and Luka Lindi?. 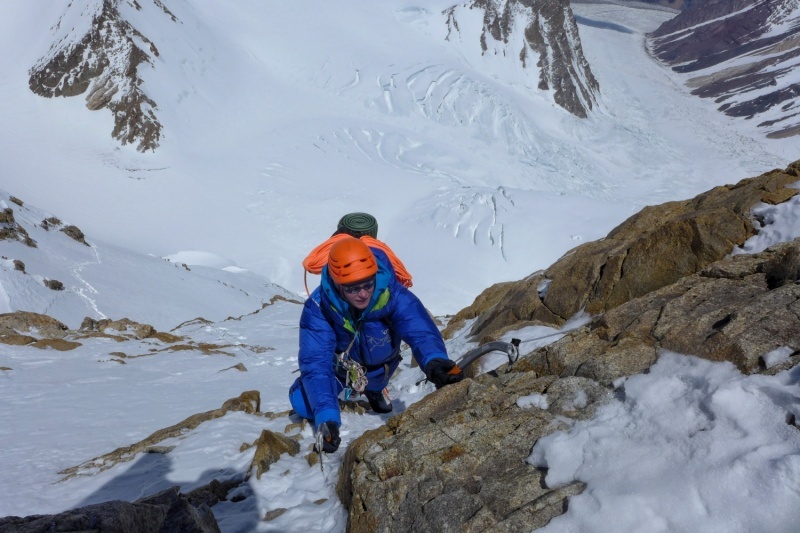 With Luka this was my first expedition and we summited K7 (west summit) after climbed very difficult Prezelj-House-Anderson route. At the time, this route was for me my most difficult and technical climb in big mountains so far. 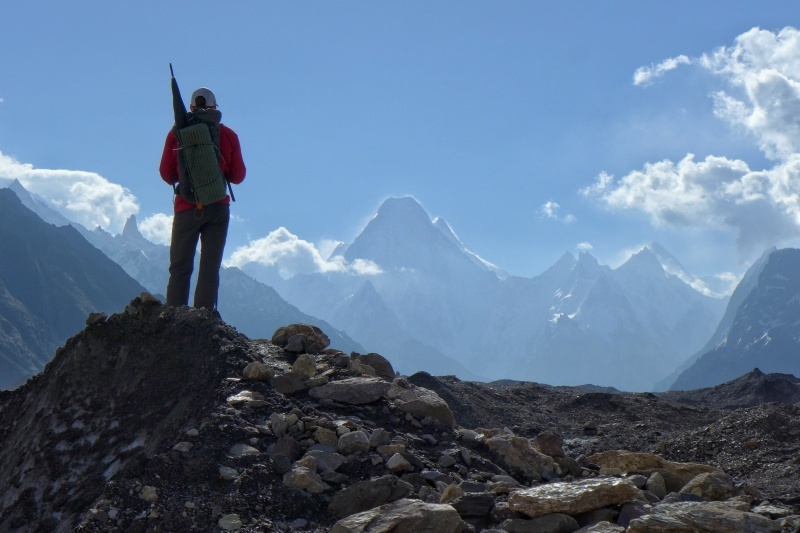 After these good memories on my two previous expeditions in Pakistan I was really looking forward for my third visit. 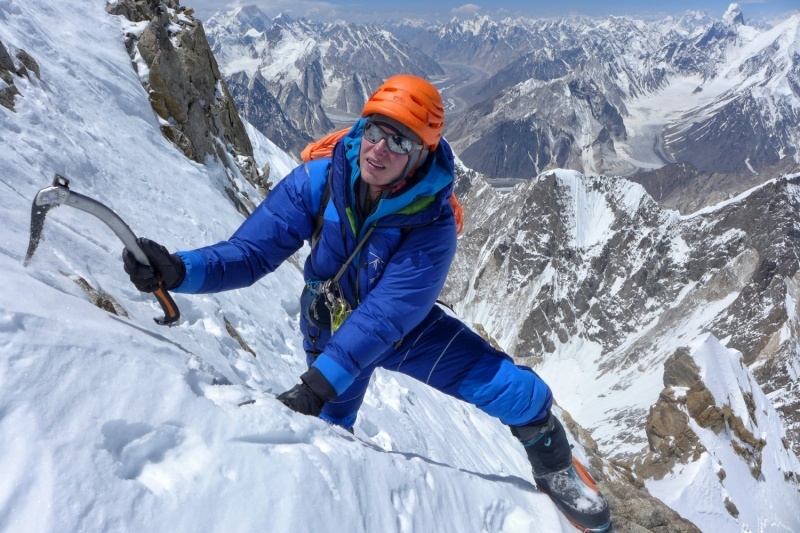 Although I was a bit nervous about climbing on altitude close and above magical 8000 m, since my highest summit so far was just a few meter above 7000 m.
First part of the trek was for me bringing back the good memories from my expedition in Trango Towers already 10 years ago. 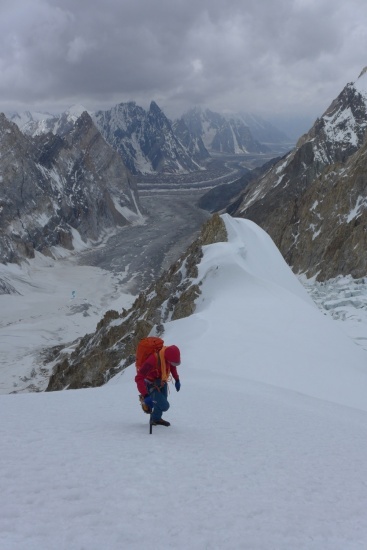 But once we climbed on the ice of Baltoro glacier, there was only one thing left in my mind and my sight as well. 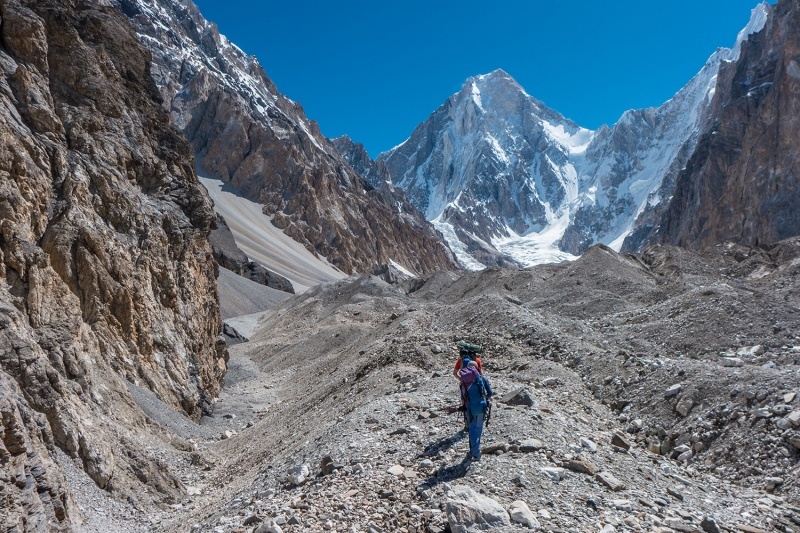 The magnificent Gasherbrum IV, which was standing on the very end of the valley of Baltoro glacier, and slightly higher Broad Peak, just left from the Gasherbrum. 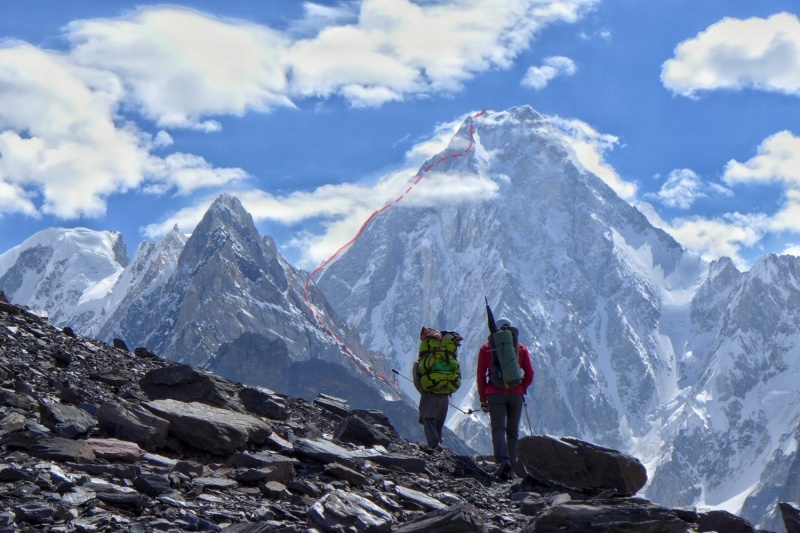 When we reached Concordia, the mighty K2 completed the outstanding ambient we were hiking in. I and Luka, we were already happy just being in such scenery, let alone the fact we were going to climb in it. 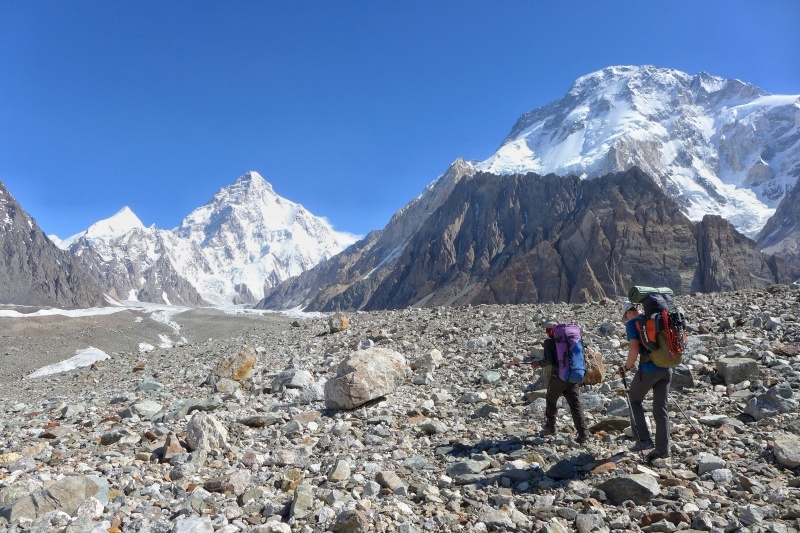 After a day of sorting things around our base camp below the Shinning Wall we were off towards Gasherbrum for our first tour. No heavy expectations and no heavy backpacks. We headed below left side of the west face, where the Korean route from 1997 begins. For acclimatization we spent the first night on a glacier plateau on altitude 5500m, and the following night about 200 meters higher. The nights were not very comfortable, but very special in special ambient of the Shinning Wall. 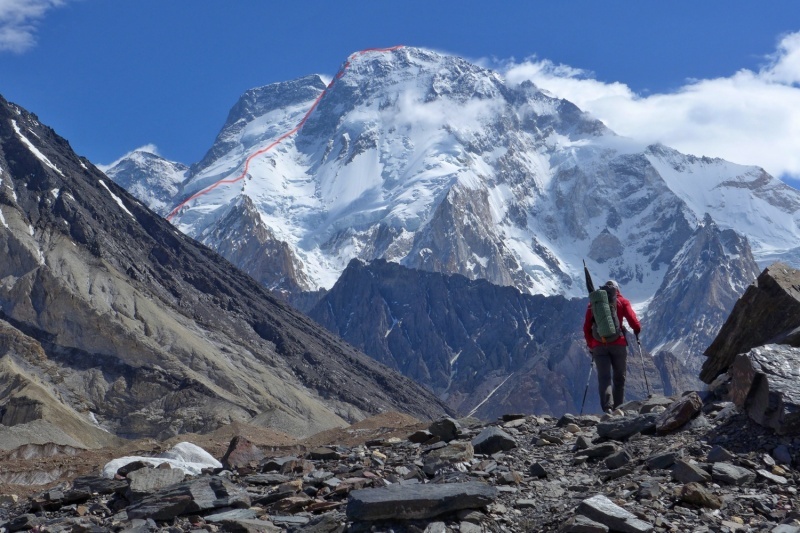 After our first tour we had to temporarily forget about the Gasherbrum IV and focus on the big giant on the left hand side. 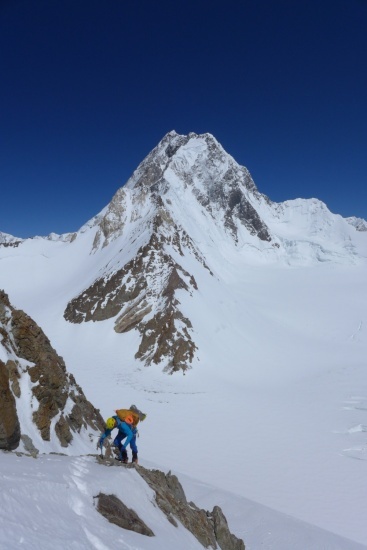 Broad Peak was for us not a prime climbing objective. Nevertheless, we took climbing on it very seriously by all means and success on it was not taken for granted or not considered as unimportant. 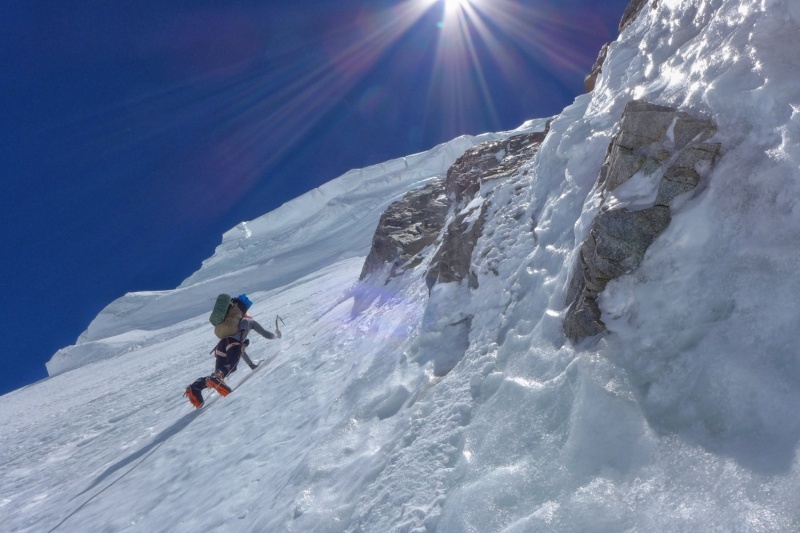 None of us stood on the summit of an Eight-thousander ever before. 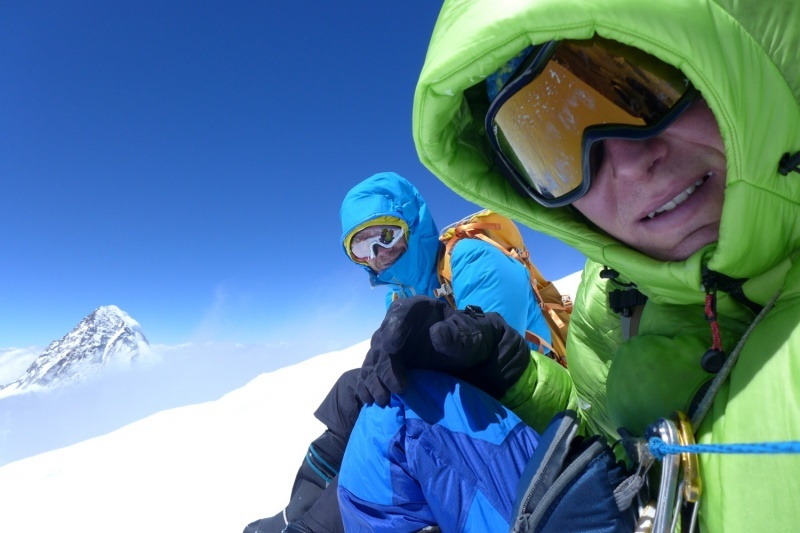 Otherwise, Luka already experienced thin air above 8000 m on Makalu, but I was never even close. 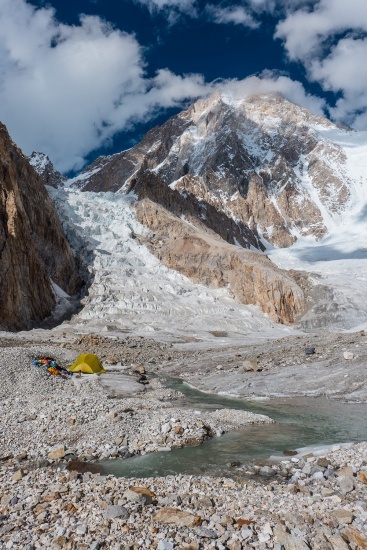 Base camp for Broad Peak was around 2 hours walk away from our base camp, which served excellent for a good warm up before the ascent. The first day we went there, we met some other group of people on the lower part of the mountain, all using fixed ropes etc. 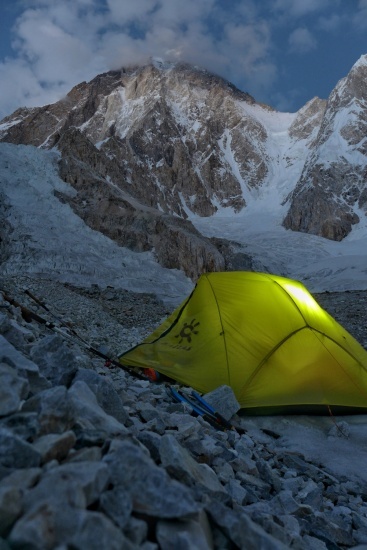 That day we set our bivy a bit above Camp 2 and spent a night around 6300 meters high. After snowy night we faced a dilemma whether is safe enough for us to continue, or should we descent back down. 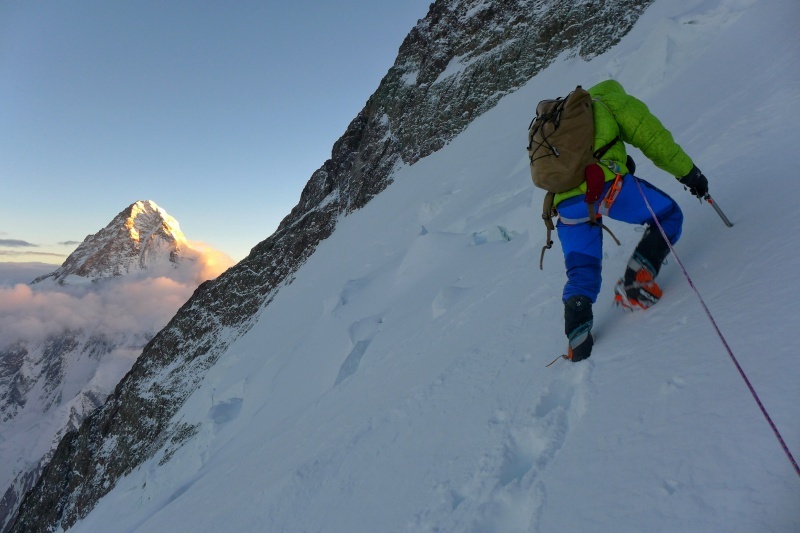 We estimated that there is not too much of fresh snow and thus we continued with our acclimatization ascent. Getting higher and higher did not help us at all with breaking trail in deep snow and by the end of the day we were anything but fresh. 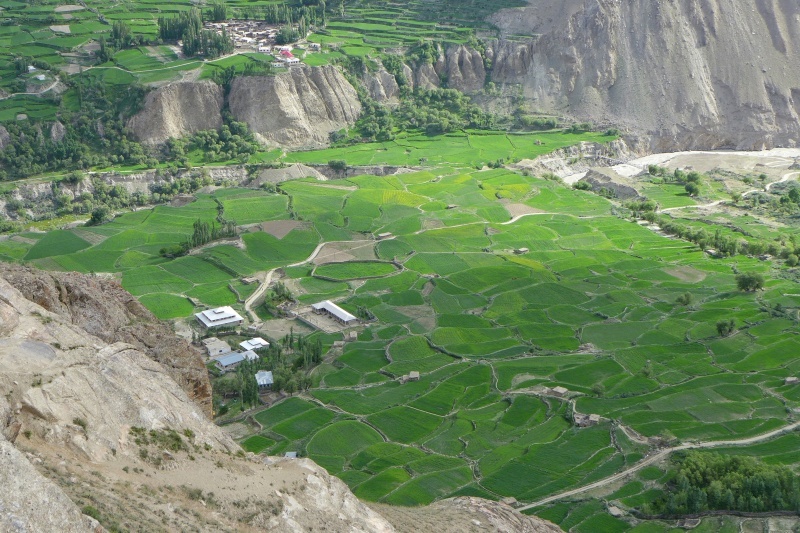 After a fantastic show of the nature at the sunset, we spent an uncomfortable night just below 7000 meters high. Hungry for some thicker air, we put down our bivy tent and start descending long before first sunlight got a chance to warm us a bit. For lunchtime we were already in a comfort of our base camp under Gasherburm IV. 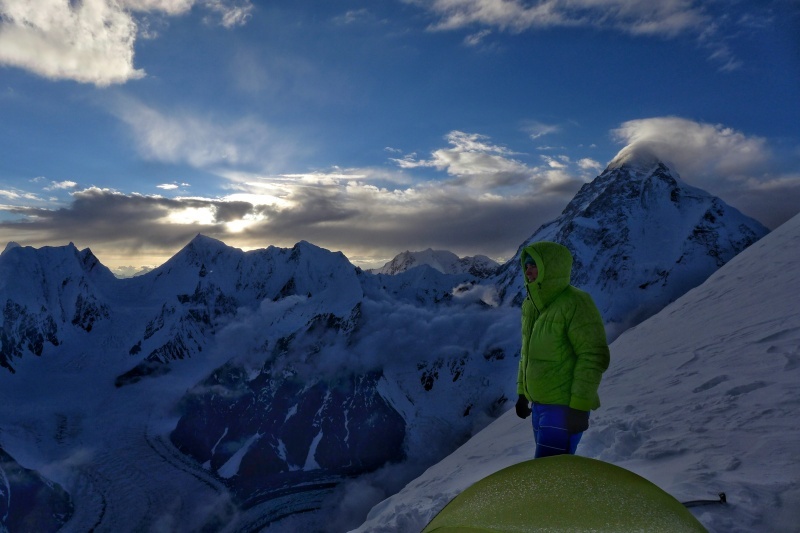 After few days of regeneration in our base camp we were ready for the first big ascent. 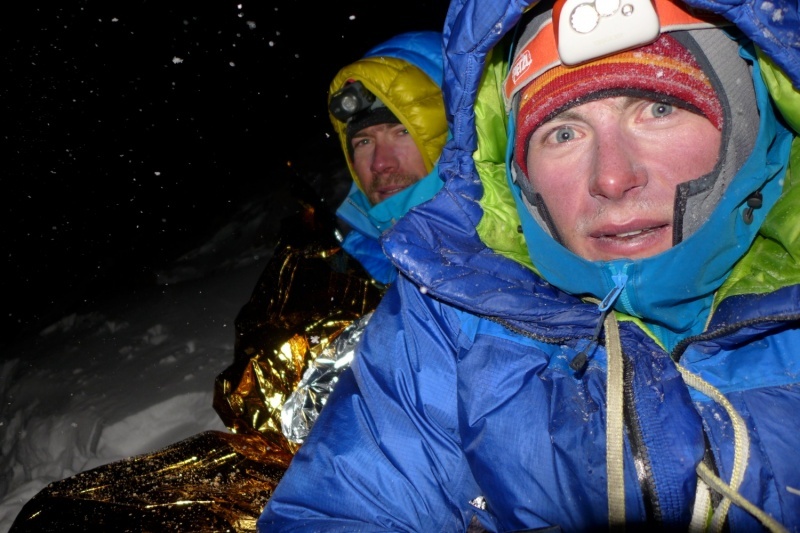 The first days we started in light rain, which changed to snow around 500 vertical meters above the base camp. In early afternoon, we reached a good spot for our first bivy at 6300 m. We were relieved when weather settled and sun starting to push the clouds away later in afternoon. 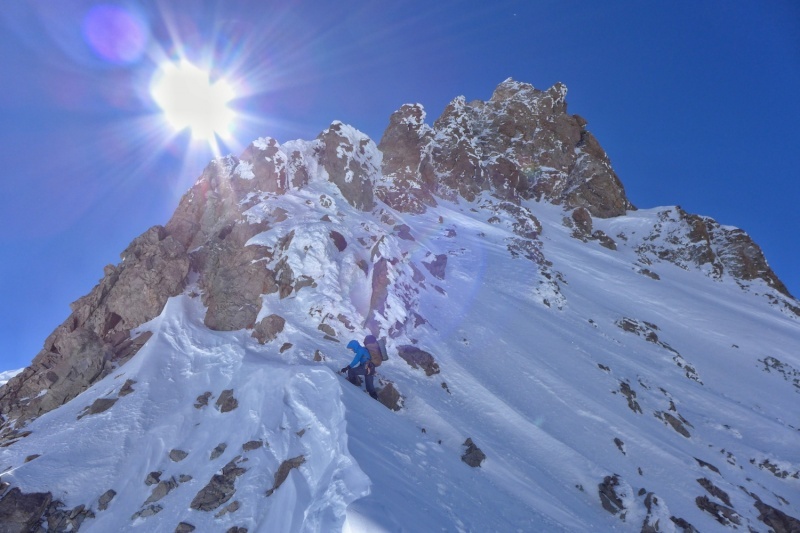 Next day we slowly but surely reached the last flat part of the snow a bit above the Camp 3, approximately 7100 meters high, where we set up our last bivy. It would be a comfortable one, only if it would be a kilometer or two lower. For the summit-day, we were carrying only minimal amount of food and water and no bivy equipment. Although we were therefore very light, it did not feel light on this altitude. Deep snow did not spare us even that day, it just got worse and we were all alone doing the hard work with breaking trail. 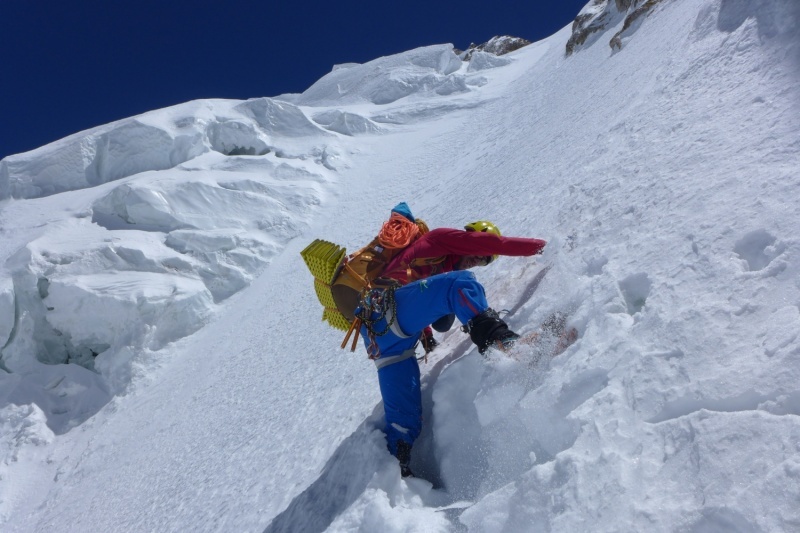 Thus we reached a mental barrier, the col between the central summit and main summit on about 7800 m high, later than we planned. From there on there was finally some easy rock climbing which was nice change and big relief after endless deep unconsolidated snow. 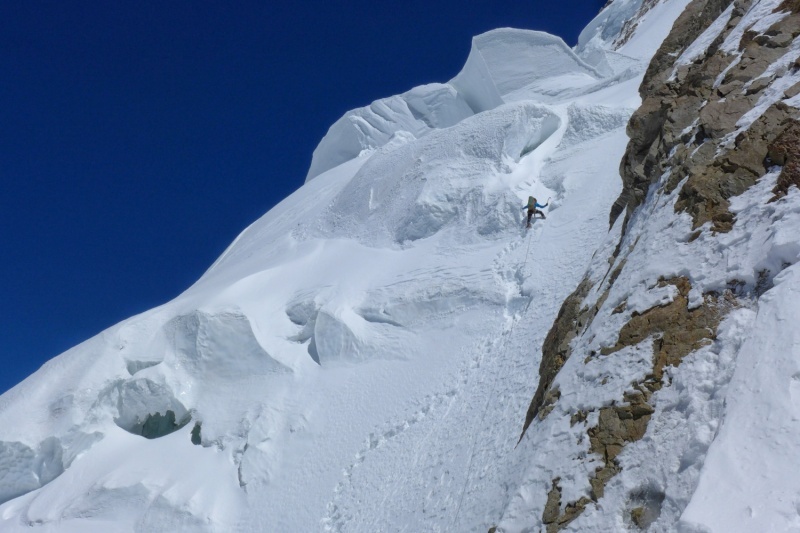 Anyway, until the summit there was still some awkward terrain while traversing to the main summit. All above 8000 meters with extremely thin air. 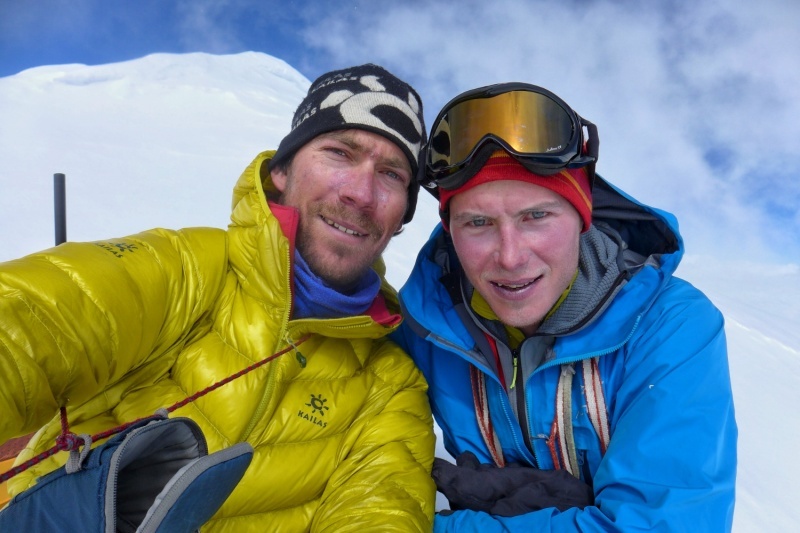 Due to high winds, there was only time for a quick hand shake on the summit. 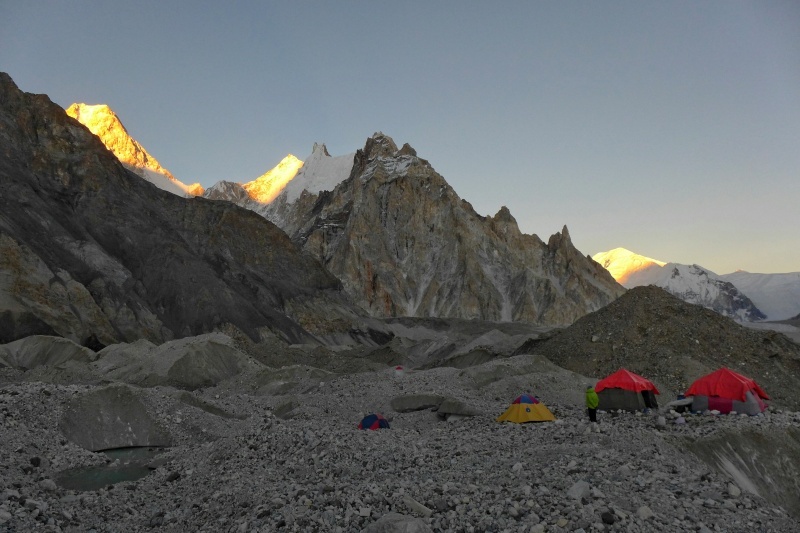 We descended to our tent above Camp 3 that day and all the way to our Base Camp under Gasherbrum IV the following day. 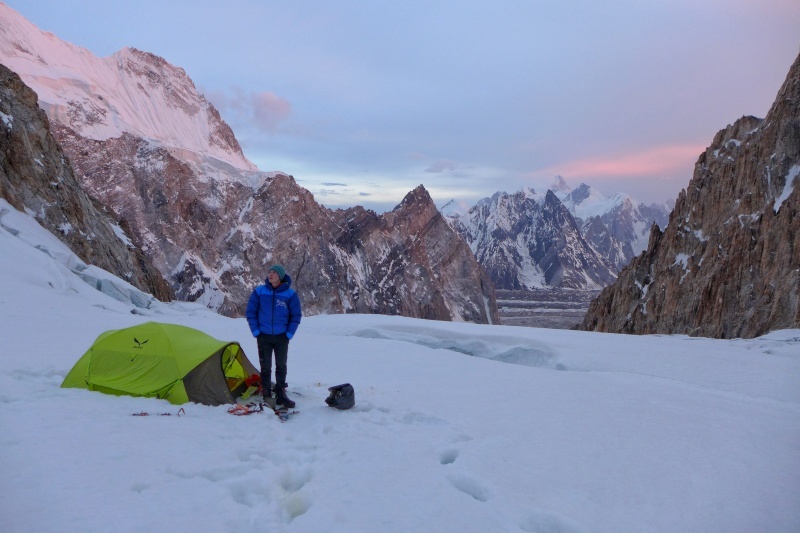 We were happy with our acclimatization and with summiting one of the prestigious eight-thousanders and happy to enjoy the comfort of our temporary home near the confluence of the Baltoro Glacier with the Godwin Austen Glacier. Mainly, we were hoping for more stable weather for the following days. Several days passed and slowly we started to feel strong and highly motivated again. We were ready for an attempt in great and scary G4, but weather was not ready yet. Finally we got a weather forecast which promised a short weather window for a few days. Unfortunately the window was too short for a realistic attempt for new route in right part of the Shinning Wall. By waiting much longer for a new potential weather window, there would be a high risk of simply running out of time. 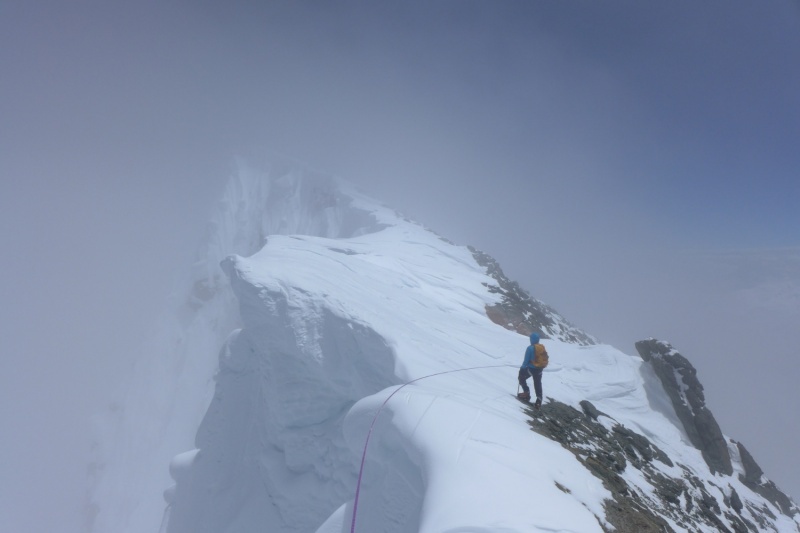 Thus we decided to give it a go for NW ridge of G4. The terrain there allows a bit faster climbing and more important much easier retread in case of unexpected bad weather. We started the very first day with reasonable weather. That day we were able to climb only to the glacier plateau on 5500 m due to many avalanches of fresh snow on a face just above the plateau. The following morning we climbed the icy and snowy gully in good conditions after avalanches previous day. 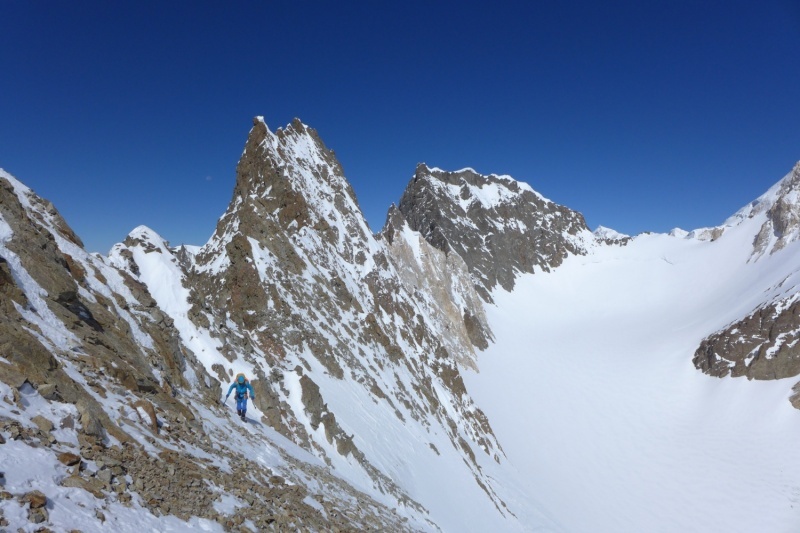 Shortly we reached the col on 6500 m, where a true NW ridge begins. From there you are climbing mainly on Chinese side of the mountain. 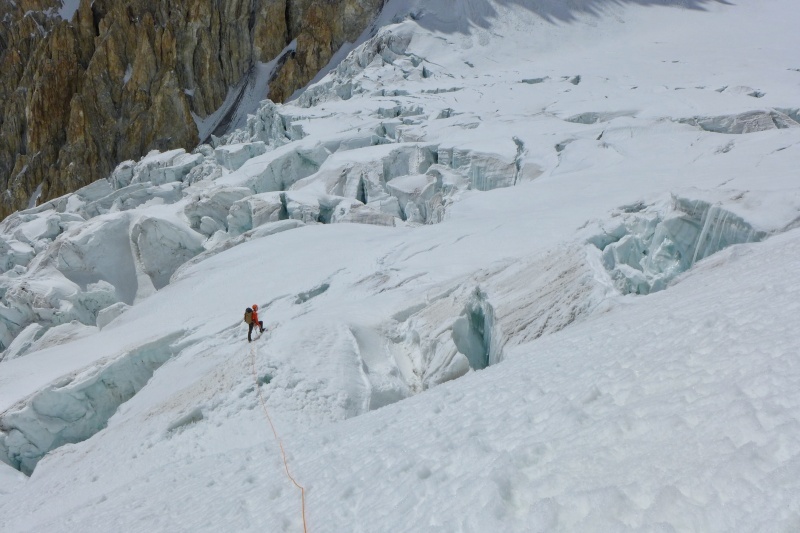 On the route we saw a lot of remains of fixed ropes, fixed by previous expeditions ten and more years ago. 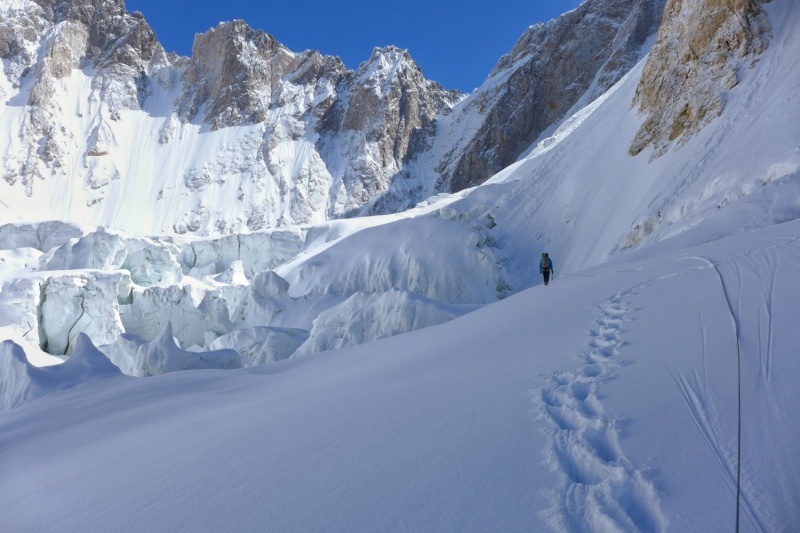 It?s a real shame fixing such a noble mountain as Gasherbrum IV and we were anything but happy about seeing this. 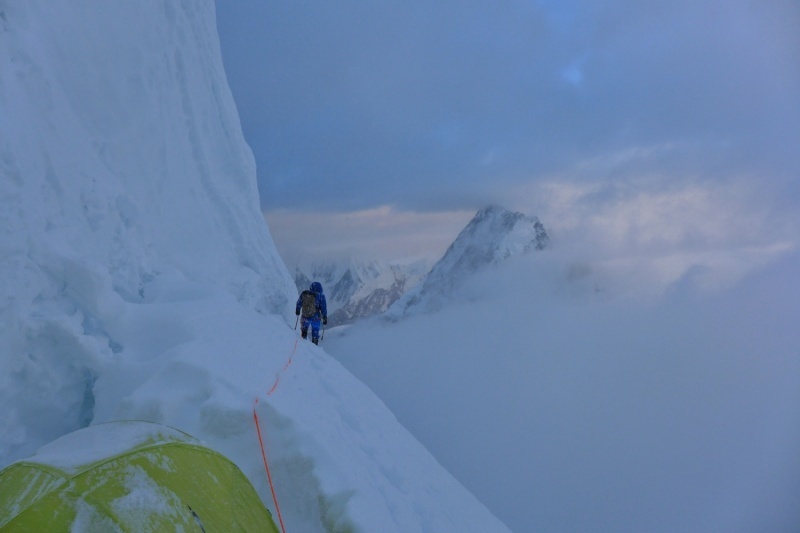 We set our second bivy on the route about 6700 m high in a good shelter just under a non-threatening serac. The next day was much longer than we anticipated. 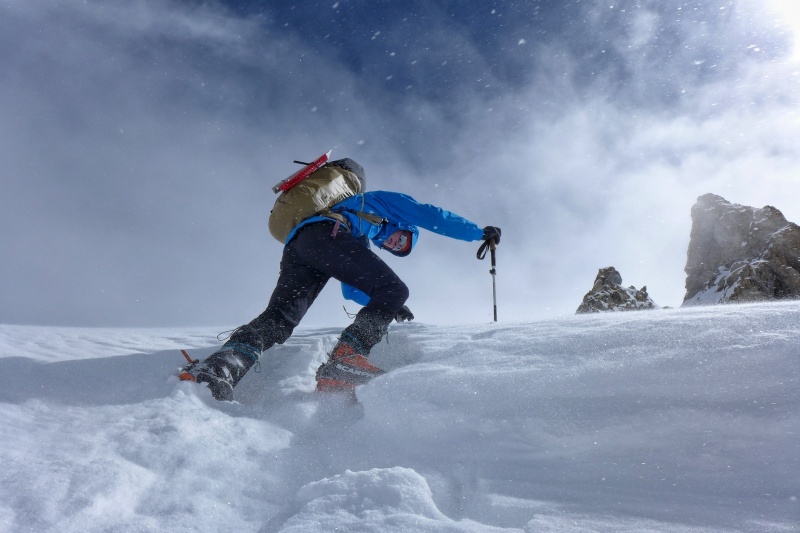 Once again, we were slowed down by unusually deep snow on surprisingly steep terrain. From time to time all the effort seemed to be hopeless. 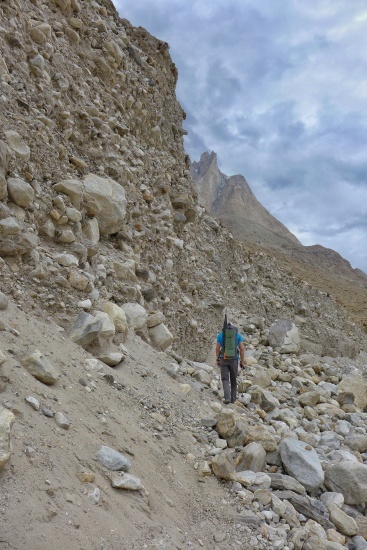 We were much faster and more efficient in technically more difficult terrain, where you had some solid rock or ice. We stopped in late afternoon when we set a bivy in a huge crevasse on the highest snow field on that side of the mountain. It was a kind of bergschrund. A tent gave us a good shelter from outside wind and snow. It?s a pity it was not also hyper-baric which would help a lot. 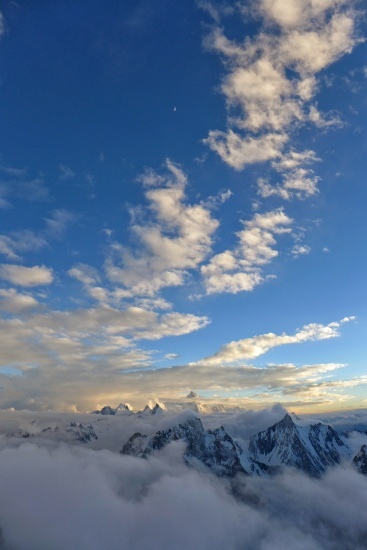 I have never slept 7500 m high before. 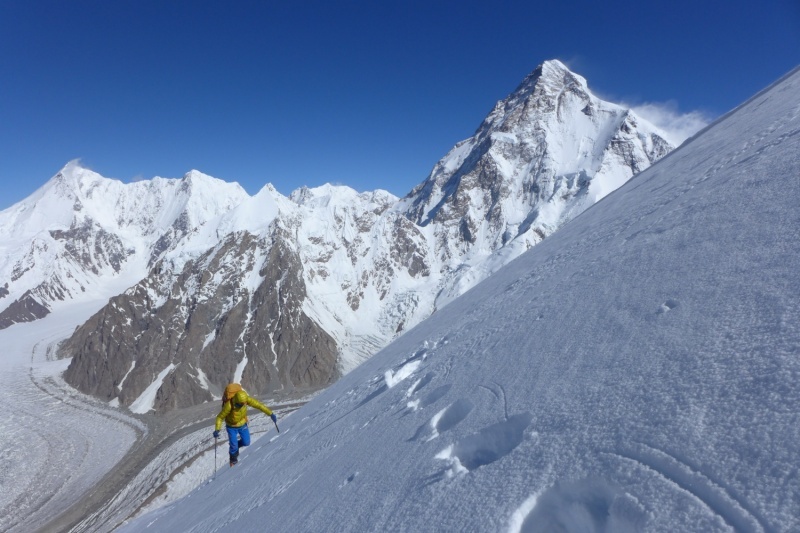 In fact, I was never much higher than only 7000 m before just a few days ago, when we summited Broad Peak. During the night it started. The bad weather came much earlier than the forecast said. 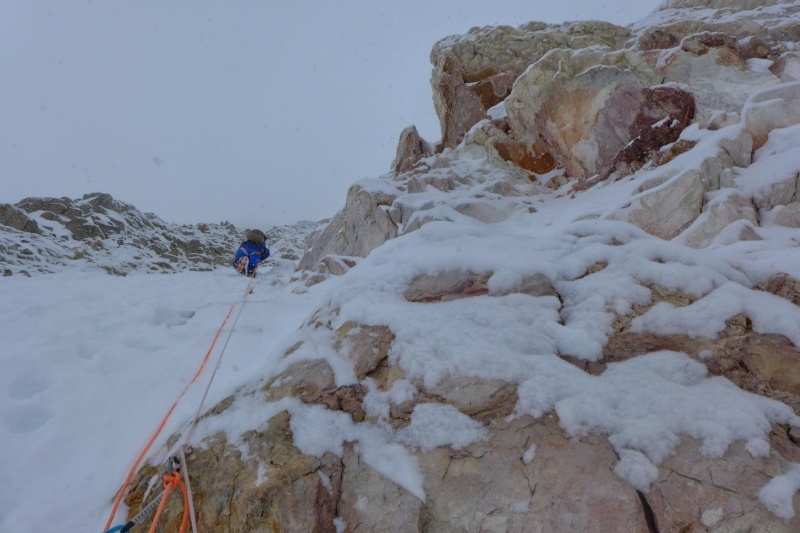 A big part of the following day we were climbing in bad visibility and snowy weather. Sometimes light snow, sometimes not so light snow. We slowly realized we would have to forget about the main summit. 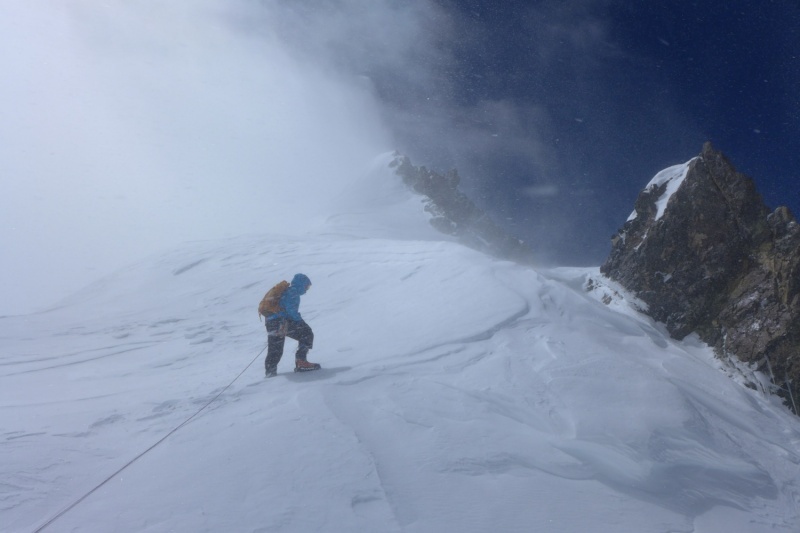 Even summiting the north summit was not for sure anymore. Luka was the first one, who said this out loud. But we both knew it for some time. 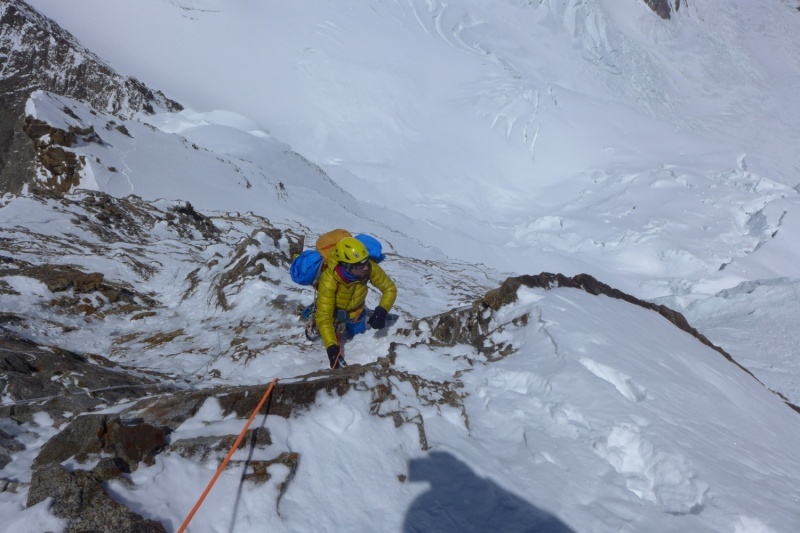 When we climbed already quite close to the north summit, we regain back some motivation. 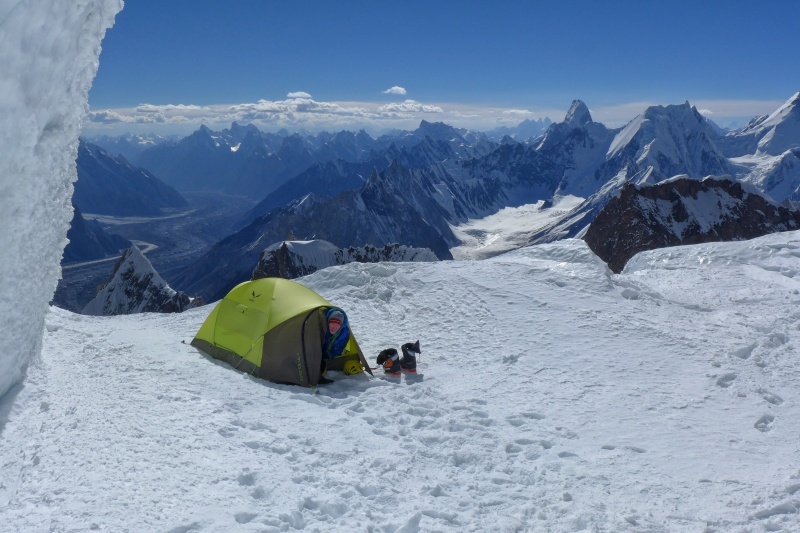 When we reached it, even the weather gave us a break for about half an hour, so we were able to enjoy outstanding view towards our base camp, Masherbrum, K2, Broad Peak and the Gasherbrum group. 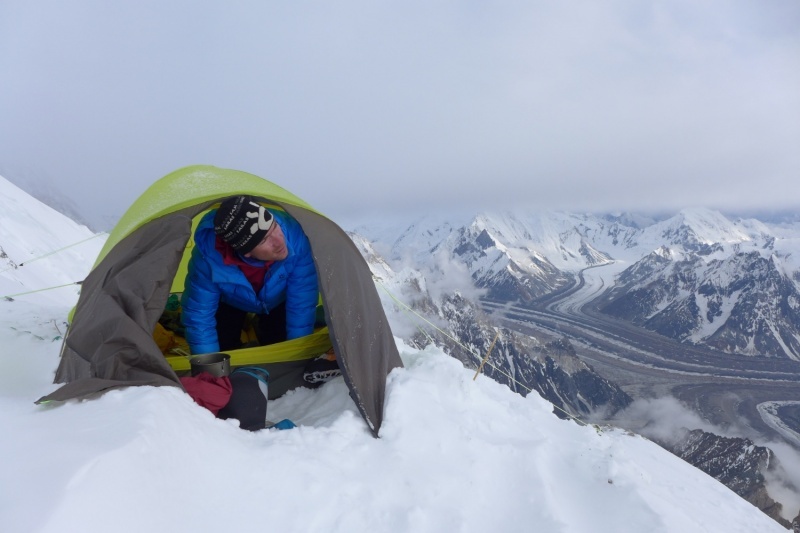 We desperately needed this break, since after we descended to our tent in the bergschrund in very poor or no visibility and we had to keep our concentration on a high level. Next day was even more stressful. It was the toughest day on our whole expedition. 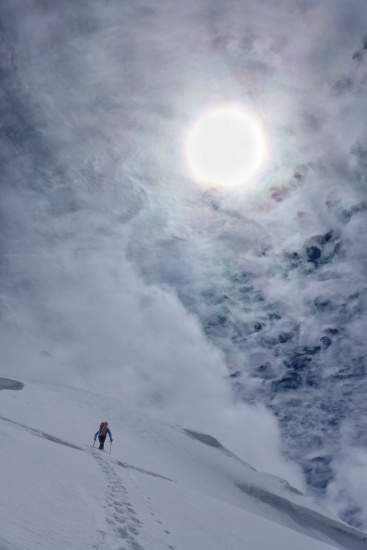 Two vertical kilometers of deep fresh snow, slab avalanches, spin drifts and occasional white out. All these conditions required all our energy, knowledge and experiences. 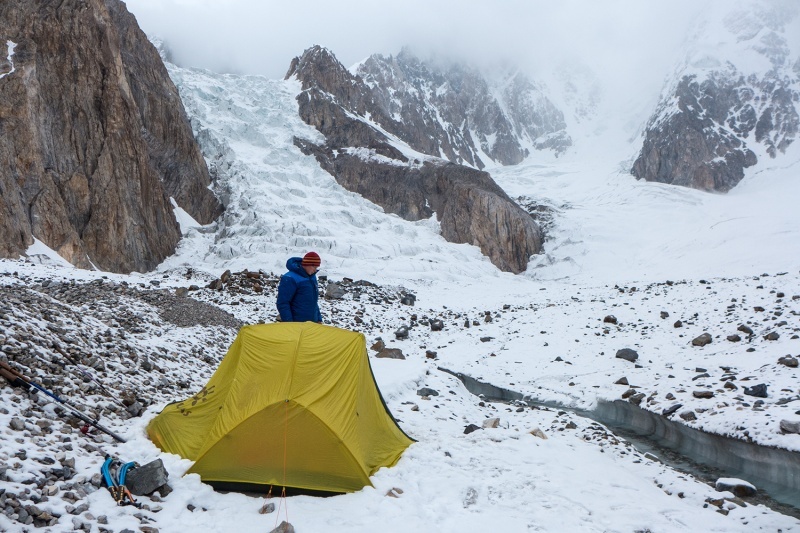 When we finally reached a relatively safe place (5500 m) we set a tent and literally few seconds after we laid down, our bodies shut down completely for a while. On the end, we are fully satisfied with what we did on the expedition. Of course, ideally we would want longer periods of good weather which would give us an option to attempt a bit more. 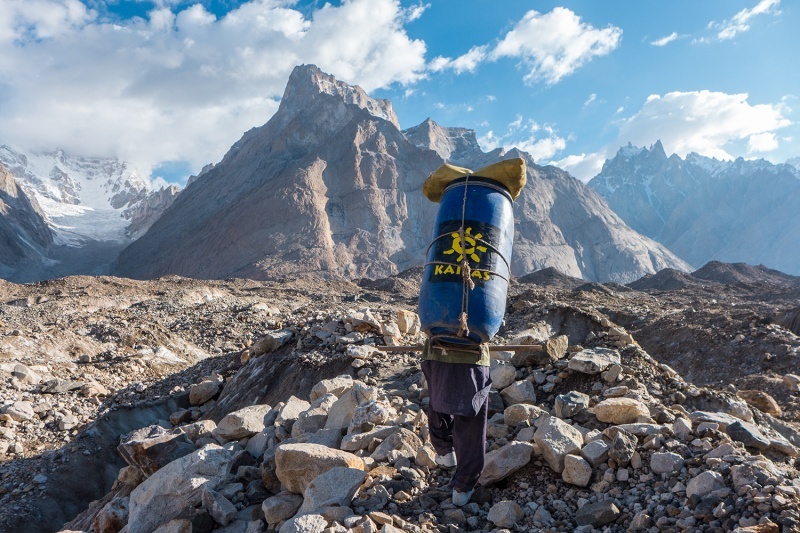 But on the other hand we were expecting this weather problems a bit since the Karakorum range is well known by its unstable weather system. When we look back now, we can honestly say, we did all the crucial decision right. 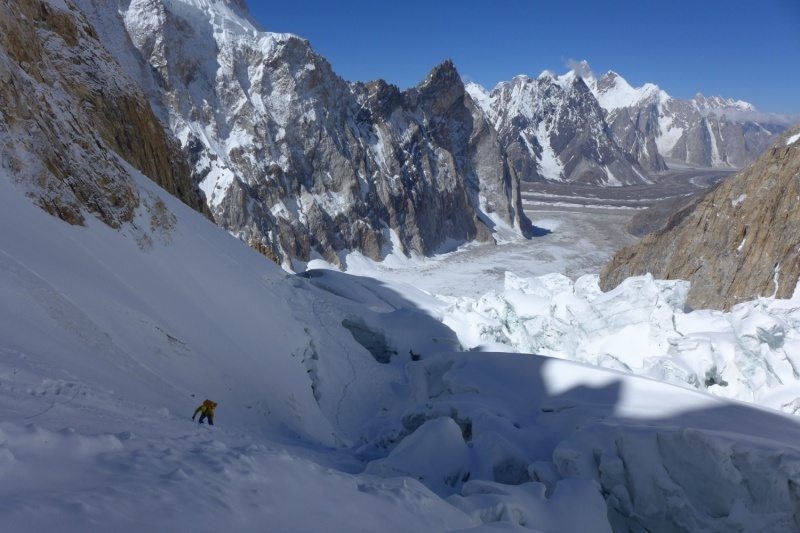 We are particularly proud on the way we handled with all the dangerous conditions, especially on the descent from Gasherbrum IV. 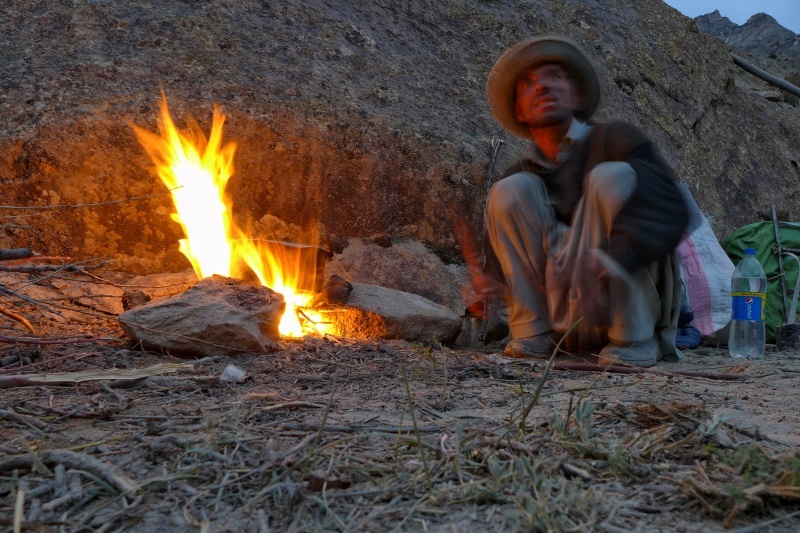 Without a generous help of certain people, we would not be able to realise this expedition. For a big support I would like to thank particularly to Kailas, Slovenian Alpine Association and mostly to my lovely family.